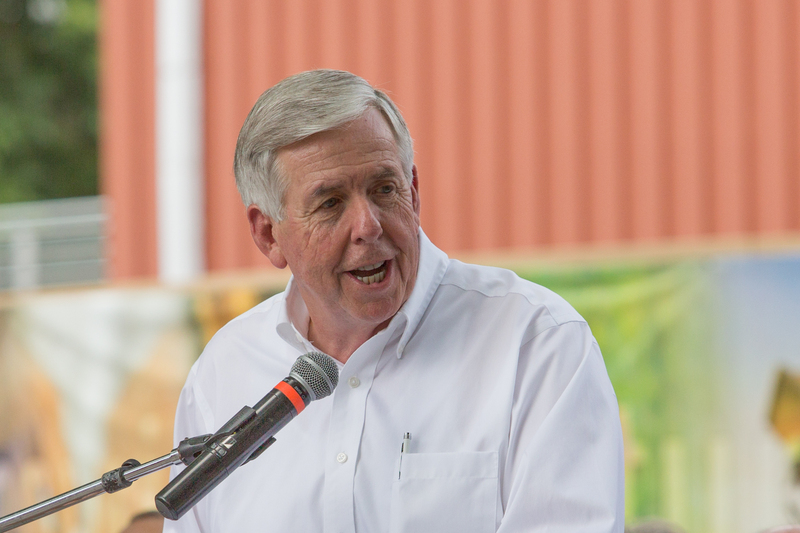 Governor Mike Parson (r) delivered his State of the State address at the capitol in Jefferson City this afternoon. Thank you Lieutenant Governor Kehoe,Speaker Haahr, President Pro-Tem Schatz, Judges of the Missouri Supreme Court, Distinguished state officials, Members of the 100th General Assembly and my fellow Missourians. I am honored and proud to stand before you this afternoon as the fifty-seventh Governor of the state of Missouri. And, one of the highest honors I have as Governor is to introduce the First Lady of the State of Missouri Teresa Parson. I am so proud of her and the grace she brings to her position as First Lady. And I look forward to the days when we have more time to spend with each other, our family, and our grandchildren. But, until that time, our dedication will be to the people of the State of Missouri. Months ago I came into office amid rare and unique circumstances, yet the focus from day one of my administration was putting the people of Missouri first where they belong, ahead of partisan differences or personal gain. We traveled to every corner of this great State, we listened, we heard, and we learned. However, to move Missouri forward, we must take bold steps and tackle big issues. I will commit to you that bold ideas and tough challenges will not be something we shy away from, but my administration is willing to work with this legislature in a disciplined and focused way, and together, we can achieve big results and lay a solid foundation for our state’s future. The honest truth is that we have not been as efficient as we can be. We don’t promote our state, our resources, and our people as best we should, and we have not prepared our state well enough for the future. And every Missourian deserves better. Make no mistake about it, we have before us one of the greatest opportunities, by working together to improve Missouri and to be the best in the United States of America. The longer we delay and avoid tough decisions, the bigger our problems become. Many of us are willing to admit this, and I hope you can agree that we cannot afford to delay action any longer. I am asking for your help to move Missouri forward and deliver results, because after all, we are the Show Me State. What this means in practical terms is that we have to be honest about our priorities and united in our focus. As elected officials, we are good at declaring priorities. While some of our priorities may not be the same, when we try to make everything a priority, the fact is nothing is truly a priority. As I have traveled the state, I know these are issues important to every single one of your districts, whether republican or democrat, urban or rural, we have good reason to work together to achieve real results for all Missourians. But our focus for the state of Missouri to thrive both now and into the future are on two key priorities, workforce development and infrastructure. Let me tell you a story about a young man with us today. Troy is an eighth grader from Eldon who has experienced some hardships in his life. Troy’s struggles are not unlike many families across Missouri. Quaker Windows is a Missouri based company that has developed a partnership with Eldon Schools to ensure students like Troy have a mentor all throughout high school. And, to make sure that he not only receives a quality education and training, but he is also taught valuable life skills, like, the importance of showing up on time and having a strong work ethic. Quaker Windows and Eldon Schools have a community partnership. This example should be a model of how we approach new efforts to train the next generation of workers. Please welcome Troy who is with us here today. Our true dedication should be to build and create wealth not redistribute it. For example, Missouri’s high school graduation rate is higher than most states. This is something we should all be proud of, however, we fall behind other states when we look at postsecondary education. We are well into the 21st century, and yes, extra levels of education are needed to meet the demands of our workforce. And these jobs are going to provide higher wages which will benefit Missouri families. This is why my budget calls for a total investment of nearly seventy-five million dollars into bold and innovative workforce development programs. When combined with our current economic development tools all can be tremendously successful. In today’s world, a higher level of education should not simply mean getting college degrees. This is why I am advocating that we provide twenty-two million dollars to fund a program known as Fast Track. Fast Track will allow Missourians to receive advanced training in high-demand areas largely taught at our community colleges, technical schools, and colleges and universities. This will open the doors for Missourians to have opportunities to earn more money for their hard work. Fast Track will benefit tens of thousands of Missourians from every corner of the state. But, to have a laser-like focus, we can’t stop there. We must also start integrating employer and industry-led input into the needs and demands of the workforce, like increasing Industry Recognized Credentials as part of our high school curriculum. As a result, we are going to consolidate, repurpose, and add flexibility to a series of incentives we currently offer into a more streamlined program called Missouri One Start. That is why I am adding ten million dollars to the Missouri One Start program, to help place a greater emphasis on building out the workforce needs and for job creation projects, so companies who use them are forced to plant deeper roots here in Missouri and become longer and more substantial partners. Also we are providing sixteen million dollars for Missouri Excels, a program for Missouri higher education institutions to develop and expand employer-driven education, training programs, and initiatives to increase career readiness. Finally, when looking ahead, we know that we are up against the clock, competing with every other state across the country, but Missouri will be ready, with the right tools in the toolbox. We’ll be ready to ensure our state will move forward in workforce development and all Missourians will prosper. Not only is workforce development going to be a priority, but to ensure future success, we also need to take a serious look at long term investments in Missouri’s infrastructure. When we talk about infrastructure, we can no longer just think about bricks and mortar, roads and bridges, but also the location in which people look to invest capital and operate the economy of the future. One of those areas in Missouri is high-speed broadband access. We currently have about ten school districts and many rural communities that lack access to high speed broadband, and that is unacceptable. Most recently, thanks to the President and our federal delegation Missouri secured two hundred twenty-five million dollars for the expansion of broadband to connect our state. With this exciting opportunity, it is also important we at the state provide funding to cover the gaps in delivering broadband. That is why my budget calls for an additional five million dollars in broadband funding to close the gap that exists in federal funds, and truly give the highest impact for Missourians. Another area of focus is to put a greater emphasis on our Missouri ports. Located in the heart of the country we are at the center of major opportunities, especially with the expansion of the Panama Canal. Missouri’s agriculture and manufacturing industries have no better route to global expansion than delivering our high quality products to the world through our waterways. In addition to our rivers Missouri has one of the largest highway systems in the country, and since we sit at the nexus of east and west, this system receives a great deal of strain. Over the years, we have seen proposals go before the voters and fail, but this cannot and does not mean we are expected to do nothing. This is why I am asking you to consider an infrastructure plan. While funded through our budget savings, it will give us the ability to begin immediate work on nearly two hundred fifty bridges across the state of Missouri, all in need of critical repair or replacement. By doing so, we will be freeing up nearly three hundred fifty million dollars in state and federal resources, allowing us to accelerate MoDOT’s current list of state infrastructure projects. Also, we will be adding a fifty million dollar cost sharing program to assist our cities and counties to help address the most serious infrastructure needs in our local areas. In fact, this raises the challenge for each of us to find even more creative ways to locate savings to make more substantial investments in our infrastructure without a tax increase to the people of Missouri. These priorities did not come without some tough decisions, but as I said to you before if we are to deliver on meaningful priorities to the people of Missouri, tough decisions must be made. As many of you know, the Department of Corrections is faced with many challenges. And, we will not shy away from these challenges. As a former sheriff and law enforcement officer for over twenty-two years I understand, firsthand, the importance of re-entry programs and alternative sentencing. We need to be more efficient in these programs so we truly offer a second chance and as Governor, I am not interested in building more prisons. In fact, we’ve identified a plan to consolidate the operations at Crossroads and Western Missouri facilities in Cameron, Missouri. This decision is largely driven by our dedication to find efficiencies wherever we can in state government and this can be done while ensuring safety, improving security, and delivering a much needed pay raise. All being done with no layoffs. Not only are we making tough decision within the Department of Corrections, but our budget recommends another major change to reorganize and streamline the efforts of the departments of economic development and higher education, a plan which will make our government more efficient. We have to start focusing more on the importance of outcome in state government and less on arguing over the inputs. While this restructuring is important for the people of Missouri, I also want to be very clear that the problem is not our state workforce. To the contrary, I have found overwhelmingly that we have a remarkable and dedicated state workforce. But, we as elected leaders must do a better job clearly identifying expectations and priorities, communicating and managing responsibilities, and providing better training to promote our success. Many of us in this chamber have programs in state government we think are important to our people, but as time goes by, Governors change and legislators return home and these programs grow with little oversight or accountability. The result is an expanding bureaucracy which becomes less efficient for the people of Missouri. Under my administration, we are going to fundamentally restructure state government, demand greater efficiency and accountability, and improve our customer service to all Missourians. I’ll admit this is going to take some time, but we are not going to put it off any longer. It will start today. Just like families across Missouri having a responsible budget is important and a way of life. For the first time in more than a decade, the Governor’s budget does not plan to spend every tax dollar. We have a business smart budget that saves nearly one hundred twenty million dollars to ensure we are prepared for any unexpected expenses. Our budget also proposes a reduction of nearly four hundred thirty government positions, all while maintaining our conservative approach to managing and streamlining government services. In fact, our administration recently completed the state’s largest deregulation effort, eliminating nearly one out of every five state regulations. And, each of the initiatives I have laid out would not be possible without the drive, commitment, and dedication of the Cabinet because we will not be able to achieve the type of common sense conservative reforms and restructuring Missouri needs without the remarkable talent and leadership in this administration. Please join me in recognizing the entire Cabinet seated in the upper gallery. It is important to understand that being a good leader is not about being the best, but rather about your ability to make those around you better. Every day my staff and Cabinet are committed and focused to making all of us better, pushing one another to make Missouri a better place. Just weeks after I took office quick decisions had to be made on over a hundred legislative items and the twenty-eight billion dollar state budget had to be approved. By working together, we were able to save millions of taxpayer dollars and implement the largest tax cut in Missouri’s history. After taking the oath of office this summer, Missouri faced some tough and difficult times. We experienced one of the worst droughts Missouri had witnessed for many years. I called the administration together, and we reviewed our options. To no surprise, we learned that the typical state government response was a series of requests to the federal government for assistance. We believed that was simply unacceptable for the farmers and families of Missouri. And instead of pushing paper it was time for us to do more. Through the teamwork between the Departments of Natural Resources, Agriculture, and Conservation we put Missouri state government to work for its people and delivered meaningful relief by working together. Again, several weeks later, we experienced tough times when seventeen individuals tragically lost their lives in the Branson incident. It was through the efforts of both state and local officials, including nearly every state department that Missouri was able to quickly respond, recover, and offer immediate assistance to those in dire need. We had tough times when we lost three local law enforcement officers, and six others were shot in the line of duty. Thankfully, by God’s grace, three members of the Kansas City Police Department are with us this afternoon after being shot in the line of duty. Please welcome these officers Matt Williams, Brent Cartwright, and Michael De-Laney. As a former sheriff, I understand what it’s like to lose an officer in the line of duty, and we owe ALL these brave men and women a debt of gratitude for their dedication to public safety. It’s only a matter of time before we again face tough situations but by faith and working together, we can and we will move Missouri forward. These are the successes I am confident we will be able to expect this legislative session because I am also willing to acknowledge no one person or party has a monopoly on good ideas, but the best ideas are those that will serve the people of Missouri. A key part of our efforts to improve Missouri’s workforce and infrastructure is improving our citizen’s health and healthcare by developing better access to providers and hospitals. Almost forty percent of Missourians live in rural areas and, we are committed to making sure they too have access to both preventive and emergency care. In addition, we will be providing a substantial increase to help those facing the challenges of mental health, expand telemedicine technology, fight the opioid crisis, and better serve those in need. I’d also like to introduce another very special guest here this afternoon, my great niece Zoey who is one of thousands living with the challenges of Autism. The First Lady and I are deeply committed to doing all that we can to learn more about, to promote awareness, and to advance Autism research. That is why we are advocating for one million dollars to ensure families and parents have access to the right resources and are equipped to deal with the challenges that come with caring for a loved one with Autism. Please welcome my great niece Zoey and her family to the chamber. And, while my focus this legislative session will be on workforce development and infrastructure we have already started intense planning for next session because we must also curb Medicaid costs, which accounts for over ten billion dollars of the state budget, and that is the reason why I hired Director Todd Richardson to lead this charge. Safeguarding the integrity of the Missouri Medicaid program is vital to the state of Missouri, nearly one-third of Missouri’s entire budget is devoted to the Medicaid program. It must be run with the highest level of integrity to ensure every tax dollar is accounted for. When I began this afternoon, I said it was time to have an honest conversation. A big part of that conversation had to revolve around all of us recognizing we can do better, and as your Governor, I am committed to trying to get better every day myself. I am willing to make the tough decisions that will put our state in a better position. If we truly care about the next generation I am absolutely confident that by focusing on the major issues of workforce development and infrastructure. Together, we will have a successful legislative session because, these are the issues that will benefit all Missourians. It is an honor and privilege to be the fifty-seventh Governor of the State of Missouri. God bless you, God bless the great state of Missouri, and God bless the United States of America. Uh, doesn’t that go both ways? Just asking. There’s a distinct difference between training and education. It would be a big mistake to conflate the two. Wait, didn’t you earlier intimate that we had to prioritize use of resource and we couldn’t meet every need? They’re called needs for a reason. Well, Eric Greitens’ (r) administration did have issues. Uh, isn’t that one of the reasons why we pay federal taxes? Or do you just want our federal taxes to go to other states? You know, like in the case of Medicaid expansion? You mean like through Medicaid expansion? Just asking. Uh, how many rural hospitals have closed in Missouri in the past couple of years? Just asking. Uh, this one is incompatible with your previous statements on access to health care in this very same address. You do know that Medicaid has a very low administrative overhead when compared to other health insurance programs (including private health insurance), right? Medicaid Administrative Costs (MACs) are among the lowest of any health care payer in the country. MACs are significantly less than private health insurance plans; typically in the range of four to six percent of claims paid. By comparison, a health maintenance organization (HMO) with administrative costs of eight to twelve percent of claims paid would be regarded as efficient and a well-run commercial health insurer typically would have administrative costs of 15 to 20 percent of claims paid. No insurer has more limited administrative costs than Medicaid. Researchers at Harvard found that 31 cents of every dollar spent on health care in the United States pays administrative costs (nearly double the rate in Canada, by contrast). Well, apparently, that already is the case. At least it’s not “Be best.” That’s a good thing.